Today some businesses are considering, or have decided, to do their own advertising internally, rather than hire an outside professional firm. The two major reasons are, cost and control, with cost being the most dominant factor. It is easy to justify lower costs when you are looking at employee wages verses professional fees. But cost savings can be deceiving. In addition to employee wages and paid benefits there are taxes, overhead, office space, furnishings, equipment, computer hardware and software along with staff support costs. These expenses are most overlooked or disregarded as management focuses only on employee wages. Then there is the “control” factor, whereby the in-house graphic designer is working under supervision of management. With a domineering boss, all outside objectivity is lost, new ideas and creativity are stymied because all the advertising direction comes from within the company. “We know what we want. “This is the way we have always done it.” So the new ad department person is relegated to just follow orders understanding that the boss is writing their paycheck. Using a current employee. If an employee is selected from the company ranks, to setup and run an ad department, it is a “best choice” approach. Selecting a person who may have knowledge of the company products and services does have some benefits. However, that individual may not have comprehensive marketing, media, PR and the creative design talent, or experience to write copy and produce professional quality photography, graphics and coordinate an overall marketing campaign. Employees tend to go along established advertising strategies and not buck the system if they want to keep their job. Hire graphic designer. These freelancers may have artistic creative flair, but lack market, media knowledge of the business product line. So the sales manager or company engineer may be required to write ad copy and provide direction. The new Graphic Designer may come in with some new, different or creative ideas but these are soon lost, as management confines to implementing existing programs. In-House employees are not considered sales/marketing decision makers. A well functioning in-house art department is responsible for designing and producing ads, collateral, the corporate website, doing PR, placing media and coordinate sales promotions like trade shows all under a comprehensive marketing strategy. The in-house employee may, have a degree of proficiency in some of these areas, but often lacks experience in others. What is lacking with most in-house ad agencies is they are limited or restricted to the capabilities of the in-house individual. Up until now a corporation had only two choices; contract with a Professional Marketing Firm which they may consider too expensive or go in-house and try and save money. 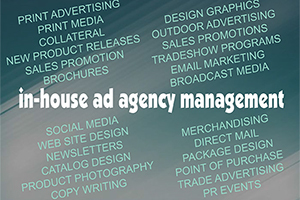 Now there is a third affordable option, there is In-House Ad Agency Management. This is the best of both worlds, the savings of in-house ad production combined with the direction from an experienced marketing professional. This service is like leasing a professional Marketing Director, and can be provided on a limited consultation basis, or extended contract. The marketing professional will provide help setting-up the in-house department to operate efficiently. IHAAM determines the capabilities of the in-house staff to best utilize their capabilities and coordinates with management on sales objectives, potential and budget. IHAAM provides on-going management expertise to bolster marketing capabilities to develop comprehensive, cost-effective marketing campaigns. Most important, IHAAM offers outside objectivity, fresh creative viewpoints and diverse marketing experience and resources provided by independent contractors of specialty services. In-House Ad Agency Management is a concept of Tom Smisek Marketing Consultants and serves firms in Orange County California, the In-Land Empire and LA. advertising, creativty, Marketing Consultant, Orange County California, sales promotion. Bookmark.